What is the NFC Ring? Make payments with your ring? The McLEAR Smart Ring is the long awaited addition to our line up. Make contactless payments with a simple knock of the hand. Available now in the UK - other countries coming soon! Our latest ring model is the perfect balance between simplification of usage and clean styles. Store and share content, in a sleek and minimalistic ring. Engineered with durable materials, providing a large operating range and enough storage capacity to hold web links or contact information, using an NFC Ring is the perfect replacement for your keys and cards. Take your NFC enabled phone out of your pocket, slide your hand on the back and the NFC Ring can unlock it. It couldn't be easier. The NFC Ring comes with two special NFC tag inlays inside the ring, one for public information and one for more sensitive stuff. 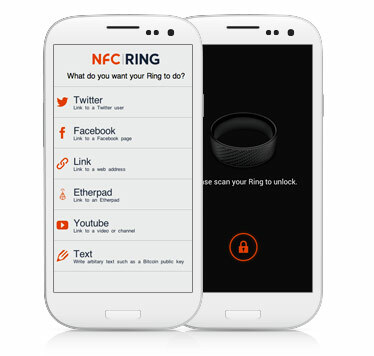 You can use your NFC Ring to share Wifi information, links to websites, links to pictures, contact information or whatever you think is suitable to be passed securely to your friends smartphone's and tablets. We invented the NFC Ring and hold multiple patents and trademarks. If you would like to enquire about licensing our technology for your own application, or partner with us to help bring your projects to life, click the button below and give us a little more information. © 2017 McLear Ltd. Registered in England No. 08308520. Registered address: McLear Ltd, 14-16 Great Chapel St, London, England, W1F 8FL, UK. VAT Registered No. GB166838466.